While anyone can use the STLCC library databases on campus, only current students, faculty, and staff may use the databases off-campus. For help with off-campus database access, visit the "Connecting from off campus" page from the link below. Through Deaf Eyes [videorecording] by a film by Lawrence Hott and Diane Garey ; written by Ken Chowder. a Worldplay, Inc. production ; Follow the journeys of four deaf entertainers who refuse to be held back by their common disability. Actor Robert DeMayo specializes in translating English to American Sign Language and teaches at Juilliard. Rendered homeless following a miscommunication with his landlord, DeMayo wages a daily struggle to get back on his feet. Other materials (marked with a notation such as "LIB USE ONLY) are not requestable and must be viewed on the campus where they are housed. To find videos on careers, select the Videos search tool from the STLC​C Libraries website. 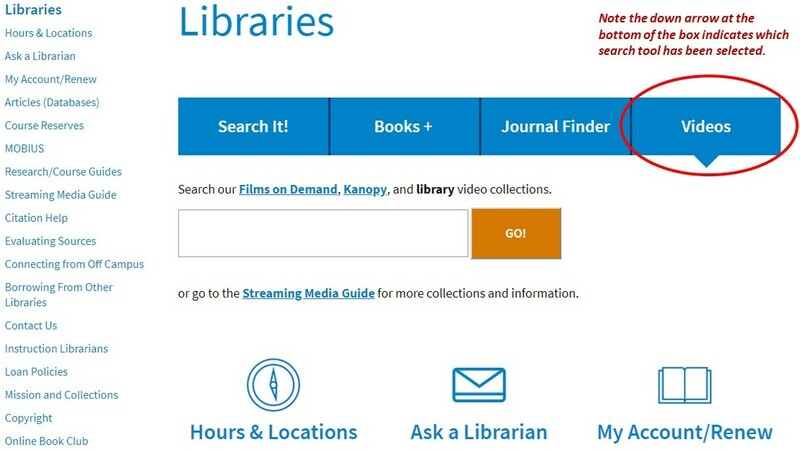 You may also choose to go to individual databases, using the links provided for Films on Demand, Kanopy, or use the Streaming Media Guide. Need Help? Use the Ask a Librarian icon on the STLCC Libraries website. The Films on Demand (FOD) database contains thousands of films and film clip segments on many topics. Films can be viewed in their entirety or by segment, making them ideal for presentations. You can create a private and free user account to keep track of favorites and playlists. The FOD and other databases offered by STLCC Libraries are accessible from any campus computer and by logging into the database from off campus (help in connecting from home). NOTE: You can use the Advanced search feature in this database to limit your search results to closed-captioned programs. This link takes you to the advanced search in the FOD database. Try the keyword phrase American Sign Language or simply deaf to begin a search. Remember, you can use the Advanced search feature in this database to limit your search results to closed-captioned programs. NOTE: YouTube is a classic example of one of the strengths and weaknesses of the Internet, which is the fact that anyone can post videos. As such, the quality and scholarly acceptability of videos varies greatly. There may be useful video clips on YouTube, but you must EVALUATE them for authority and relevance. Before referencing any material from YouTube (or other video sites on the Internet) in a paper or using a clip in a presentation, though, it is highly advisable to check with your instructor concerning the acceptability of the video for the assignment.